The historic village of Old Bennington sits on the western end of Bennington. Most buildings in the village are historic. Route 9 runs east to west through the village. Old Bennington has significant historical significance and is one of the earliest Vermont settlements. 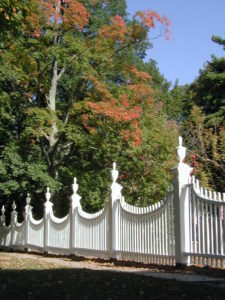 The village is well known for it’s well preserved Revolutionary war-era homes and many homes have plaques indicating the historical figure who had owned/built them. Among the many historic building are The Old First Church and The Bennington Battle Monument. Robert frost and his family are buried in the cemetery behind the Old First Church. Sitting on the hill overlooking what is now Downtown Bennington this district housed many well known Revolutionary war heroes and many that became known as the “Green Mountain Boys”. Over the years the village has taken extraordinary steps to maintain the look, feel and authenticity of the village. While many of the houses interiors have been updated and modernized the exterior of each home conforms to specific “Old Bennington” standards. Most of these homes are larger for the area and are colonial style homes.